check out our design process to see how we work with you. Graphic design is essentially the narrative between typeface, images, space, color, and texture to form the creative whole. One couldn’t exist without the other or it really wouldn’t be design. Graphic design is all around you and you my not even know it; we casually see it in our daily lives from movie posters to the wrappers on the food we buy to billboards to magazines and even comic books. It’s inescapable, graphic design is everywhere. While it’s true that graphic design is in fact, everywhere, what is also true is that a large majority of it is run-of-the-mill; for design to be memorable and drive the product home, it has to be done extremely well and be very pleasing to the eye. Advanced Frequency firmly believes and stands behind the quality of work we produce and we know that our final products are ones that will leave lasting impressions. Advanced Frequency has been providing top quality graphic design services for over ten years. We aim to create powerful designs for your company that will effectively spread the message about it and its ideas. We want to help you increase your sales and bring in more business through our compelling campaigns and graphic arts. It’s very important for us to take great care with all of our clients’ projects because your work is an overall representation of us and we always strive for perfection. With our graphic design experience coupled together with our web design, web development, and photography we offer you a winning combination that can ensure your business’ success. 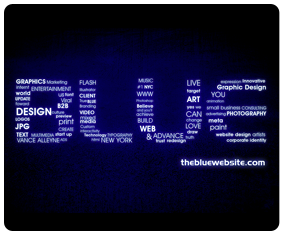 We specialize in custom graphics in the fields of both web and print media. Some of the graphic design work we do are branding and corporate identity, logos, flyers, brochures, posters, packaging design, presentations and just about any other form of printed material. Advanced Frequency will work to grasp the finer points of your business and create high quality graphic arts specifically designed and catered for its needs. We strive to consistently produce the best graphic and web solutions while at the same time producing quantitative results for your business. "A proper logo combined with complete branding will provide you with the tools to fully deliver your message to the mass market. The more professional you look, the more professional you feel, the more successful you become." It’s been said that a picture is worth a thousand words, in most cases this is true. A solid image can evoke more thought, passion, and intrigue than most words ever could. This is exactly what the purpose of a logo is for; to capture that intrigue while at the same time displaying the values and goals of your company, all with one visual graphic. While this, in essence, seems quite simple, it may be the single most difficult aspect to pull off in all of design; it is also the most fulfilling. In reality, you only have a few seconds, if your lucky, to grab someones attention and if done right, a logo is the perfect attention grabber. Logos are the embodiment of a business, they represent the brand and are the most recognizable element in corporate identity. You want a logo to immediately cause customer recognition, this will help build your brand and create a connection with your audience. As with your product, marketing materials, and website; your logo should provide a solution to a problem. In this case, how to be seen. While a logo is the heart of a business’ corporate identity it’s not the only aspect, just the main component. You want to take the major elements and themes of your logo and inject them into all of your marketing materials; be they websites, flyers, business cards, letter heads, envelopes, etc. Everything must mesh together to become a cohesive unit. The key aspect in corporate identity and branding is consistency. A proper logo combined with complete branding will provide you with the tools to fully deliver your message to the mass market. The more professional you look, the more professional you feel, the more successful you become. Advanced Frequency will work closely with you to create unique, innovative, and visually appealing logos and corporate identity branding that will strengthen and modernize your company. We have helped companies of all sizes successfully redefine their brand and we have years of experience creating brand identity; we will work closely with you to ensure that your branding is in sync with your themes and the message is clear. We take pride in our work, so everything we do must not only meet all your needs and aspirations, but it must meet our own high quality standards. Copyright © 2013 Advanced Frequency. All Rights Reserved. Any unauthorized use of the Advanced Frequency logo, graphics, artwork, or text without written consent is prohibited.